Day 46: Succinct Health Care – Just pay for it yourself! * Another guest post by Stephen J Gaines, our Director of Membership Experience. Stephen discusses ways to simplify your health care experience by paying for it yourself. In a recent conversation with my boss Scott Shreeve, MD, we were discussing how we need to keep health care simple. He likes big words so he was using the term “succinct” to describe what he meant. Since I am much more a visual and hands on learner, I wanted to show him “succinctness personified by ordering a book from Amazon with my iPhone. He recently posted about this, but I thought I could build on that experience and translate it into how we can make everyone’s health care experience approximate what I had just demonstrated. I will be laying this out in several post, but I wanted to set the table with the first very practice way in which we can dramatically simplify the health care experience – just pay cash for all your basic healthcare expenses and don’t involve your insurance company or any other third party payer. How simple is that? Ok, now you can now pick yourself off the floor and stop laughing. I realize at first pass this sounds pretty insane, right? After all, doesn’t insurance save you a lot of money when it comes to day to day healthcare? Well maybe, or maybe not. What a lot of people are discovering is that after paying their monthly premiums and co-pays, that they’re paying a lot more than they realize. In addition, people are also discovering that most healthcare is dictated by what the insurance will or won’t pay. And then, there are the unbelievably inflated cost of drugs, laboratory tests, imaging . . . ok, ok, i’m getting way ahead of myself. Before going any further, I need to set the record straight. I’m not advocating abandoning your insurance company. You still need health Insurance. If you or a family member faced a catastrophic healthcare need, you will need your health insurance. Fees for specialists and hospital stays can bankrupt you if you fail to have insurance. Enough said. The above example is real example from one of our employees who has a family of 6 (2 adults and 4 children all healthy) people. 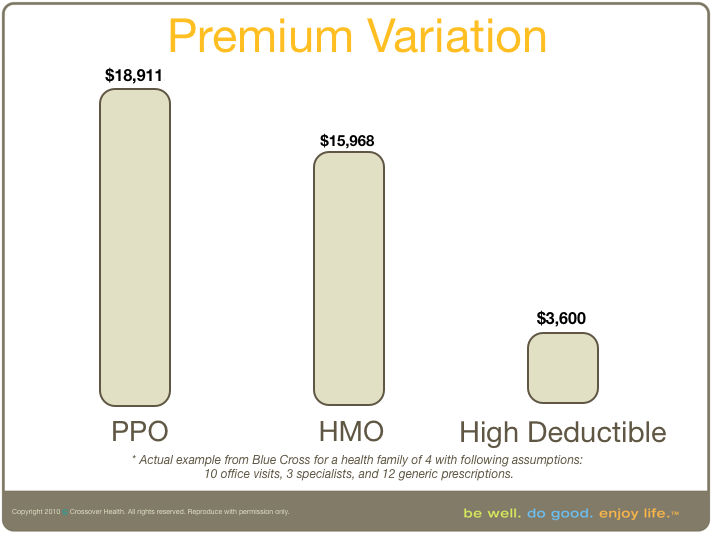 Remember, the above figures represent just premiums alone – they don’t account for any deductible, co-pays, or co-insurance which are additive to each one of the above plans. The point of the matter is that most people will unwittingly pay literally THOUSANDS of dollars difference to have a lower transaction cost at the doctors office. However, they don’t realize they (or their employer – subject of another post) are paying THOUSANDS of dollars for this privilege. A far better financial decision would be to take on some of the heath risk associated with paying for your day to day health care costs yourself and pocket the money in your own bank account as opposed to your insurance carrier. Over the next couple of blogs I’ll discuss Crossover’s Health’s “cash for care” philosophy (in the form of a membership) and how paying for day to day healthcare as part of Crossover Health’s network may be less expansive than you realize. To help drive my point home, we’ll be discussing multiple scenarios – Family of six , newlyweds, retirees and single individuals – to highlight that you could be getting so much more for what your paying by getting more value for what you are paying. My whole entire point is not to be your insurance broker, but rather, to highlight to you the value of a membership in a program like Crossover and then to show you how you can pay for it – most often for a large discount over what you are currently paying for premiums alone. Previous Post Previous post: Day 47: Succinct Health Care – Is there an app for that? Next Post Next post: Day 44: Lets Get this Party Started – It’s Hammertime!